It was not easy to be the mother of a girl in Afghan society. Your pride and values are dependent on how many sons you have. More daughters require so much more responsibility and control within the family. My mother had to be very strict. She had a daughter, and having me was a shame. It was as if I was the dark cloud over the head of my mom. If I had a question I didn’t need to read a book and find my answer. Mom knew everything and had advice for every single thought I had. She was considered the messenger of my life, and when I closed my eyes I saw Paradise under her feet. My mother was a typical Afghan woman. She learned that in order to be a good mother you must be a good wife first. She was silent as a stone sculpture when my father spoke to her and when she came to me, she let out her anger. She suffered for having a daughter, and my poor mother could not hide it. She tried not to show me every time that I was worth less than my brothers. She tried to observe justice. Any time she beat my brothers, she came and beat me too. She wanted to show us that we were treated equally. But I didn’t do any thing wrong. I swear. Spanking, beating, and violence were legal. In Dari she would say: Ta nabashad chob tar, farman nabarad ghaw wa Khar. It meant that if you don’t beat a cow and a donkey with a wet wood stick, they will never obey you. She believed this was the way I could become the best woman in the world. I can’t forget my teenage years when Mom was so afraid when she saw I was growing. Every month when I had my period all I wanted was a place to hide from my mom. But the pain and the acne on my face told her everything. I was beaten when she realized I had my first period. These were the most difficult days of my life because I didn’t know how to escape from the eyes of Mom or how to stand up against the natural rules. I looked at the sky and asked God, why did you create me a woman? She taught me to hate myself as a human and as a woman. Despite it all, I can’t say I don’t love my mother. I do love her very much. I know that she is not the only one who grew up to be this way, and she learned these methods from her parents. My mother thought this was the way she could bring up a good child. In this way she thought she was the best mother of the world! In Afghanistan, for some parents the worst day of their life is to hear that they have become mother or father of a baby girl. Women have no place at home or in the society, so when they become mothers, they become dictators for their children. It is like a surprise! When a woman becomes a mother, she becomes important. I am afraid it is because of the men who first force a girl at marriage to produce children for them. If a mother is not a good mother, how can she deserve respect? Why would a man respect a woman who sleeps with a man and brings up a child without a plan or program? 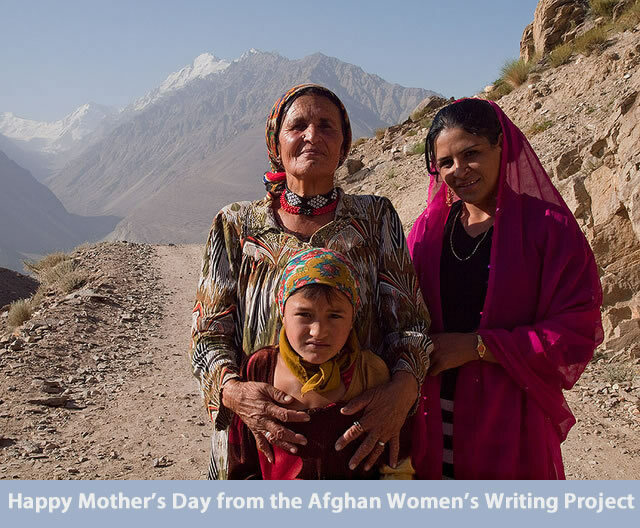 It is hard for me to say: “Happy Mother’s Day!” to a woman who accepted an arranged marriage. Her first child is asleep, the second one at her breasts, the third is in her stomach, and the fourth one is grabbing her feet, screaming, “Mom, I am hungry.” Was it her choice to become a mother? Now I am a mother myself, and I rejoiced when the first word my son learned was to say “No.” I put the date in my calendar to celebrate it every year. It is important to respect our children, and not expect too much respect just because we are mothers or fathers. We have responsibility to bring up good children and do our job very well. I try to show my son the right thing and right way and to stand behind him to support him. His father and mother offer him two gifts: love and freedom, and with these he will be able to climb the ups and downs of life himself. A good mother is a unique gift in our lives. When mother’s day comes, I don’t know how to express my gratitude for good mothers, because, to be honest, I have not seen one in Afghanistan. Maybe I was unlucky, but if you know one, send her my love and hugs. This is a beautifully written, painful essay about your mother, Pari. I admire your willingness to share these difficult memories with us. You have learned from your mother’s great mistakes and I feel confident that your son will grow up to be a good person because of your love and willingness to accept his independence. You are a strong mother in all the right ways — Happy Mother’s Day to you. Thank you for sharing. This must have been a difficult essay to write and I admire your honesty. I rejoiced when I had my daughter and am grateful I can celebrate her and help her be educated and strong. I hope that if you have a daughter, writing this essay will make you think about what being a good mother would mean to her. This is a tough piece to read, so I can only imagine what kind of pain was brought out of you while writing it. You sound like a wonderful, spirited mother that recognizes and passes along learning experiences. Thank you for being so open about your life and what you have learned along the way. Thanks for sharing your stories. All the content in your stories that I have never read before. It astonished me how much suffering to be a woman in your country and the social status of women is so unequal with the men. It must be really tough for you to tell all the story and feeling bad about the situation in your country. I want to say that your mother is still loving you and there would be a lot of people would support your opinion on the website. I hope all those social problems would be solved in recent years and created a good environment for your children and all the other Afghanistan women.